Claregalway winners: Back row, Maria McMahon, Annie Rozario, Jean Carpenter (captain), Audrey O'Toole. Front row, Brian Casserly, John Paul O'Connell, Kevin Moran, Jubin Thomas, Justin Lane. The club was the winner in Grade G at the national championships held at the UL Sports Arena in Sunday. Having won the Galway League, which ran from September to April, Claregalway then went on to take the Connacht title last month, defeating teams from Mayo and Sligo. Sunday's All Ireland final was played on a round-robin basis among Nomads, representing Wicklow and Leinster, and Tourin, representing Waterford and Munster. Claregalway came out on top 4-3 after several tight three-set matches against Nomads, and in the second match of the day Claregalway sealed the title with a 4-1 over Tourin. 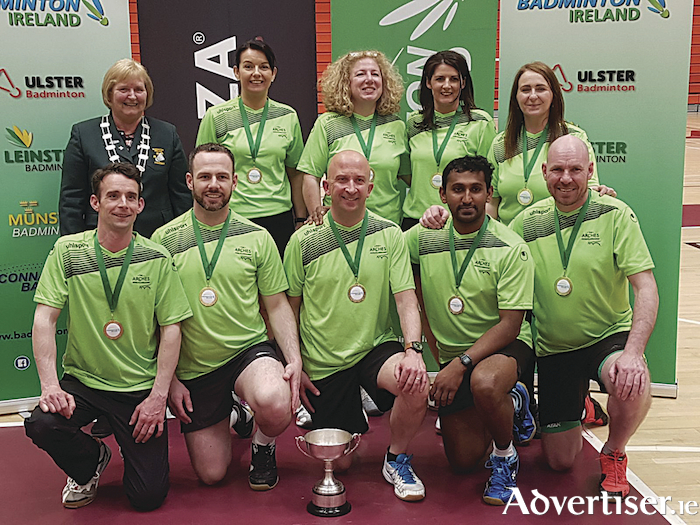 This was the first time Claregalway Badminton Club has tasted All Ireland success - a huge achievement for the coaches and players - a number of whom have played with the club from U12 level.